The greatest source of wasted heating and cooling energy in a home is air leaks. Let’s look at an example. If you have a pair of 6′ 8″ exterior doors in your home that don’t have weather-stripping, you can easily have an opening of ¼-inch all along the edge where the doors meet. This ¼-inch gap adds up to a 20-square-inch opening to the outside. If you saw a hole this big in your wall, wouldn’t you want it fixed? Caulking and weatherstripping are effective ways to rid your home of these costly leaks. In hot, humid climates our biggest concern is hot air coming into our air-conditioned home. However, during winter the opposite occurs, our heated homes leak warm air to the outdoors through cracks and crevices. All air leaks should be repaired with appropriate caulk or weatherstripping. Generally, you can use caulk to seal openings up to ¼-inch wide. There are also sealant products that come in aerosol cans; these are generally a good option for closing holes up to ½-inch. Be sure to follow manufacturers’ directions. For larger gaps, foam backing material should be put in place before caulking. In addition, leaks around electrical outlets can be handled by installing foam “gaskets” (specifically made for this application) behind outlet plates. Where Should You Caulk and Seal? Windows and doors are the obvious places to check for leaks; you should also check where plumbing, ductwork, fans, or electrical wiring penetrates through exterior walls, floors, and ceilings. 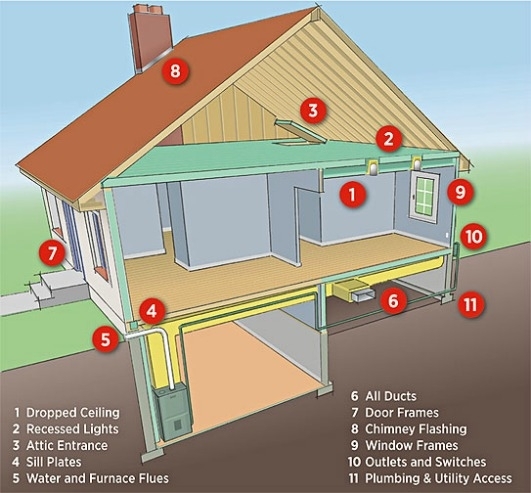 Figure 1 shows the most common sources of air leaks in a typical home. Figure 1. Sources of air leaks in a typical home. [Click image for full size version.] Credit: US/DOE Energy Saver Tips: Sealing Air Leaks. How Do You Check Your Home? When looking for drafts, start by visually inspecting penetrations in ceiling, walls, and floors. For windows, check the outside for any sign of caulking that has cracked or peeled. Make a simple draft-checker by taping a piece of tissue paper to a dowel. On a windy day, move the draft-checker around windows, doors, electrical outlets, ceiling fixtures, attic hatches and other locations inside your home where there is a possible air path to the outside. Air movement around these spots could mean an air leak. You can repeat the process while running your kitchen or bathroom exhaust fan (if they vent to the outside). When checking for leaks around doors and windows use a dollar bill: insert the dollar bill in the opening. If it falls out or slips out easily, the weatherstripping should be repaired or replaced. 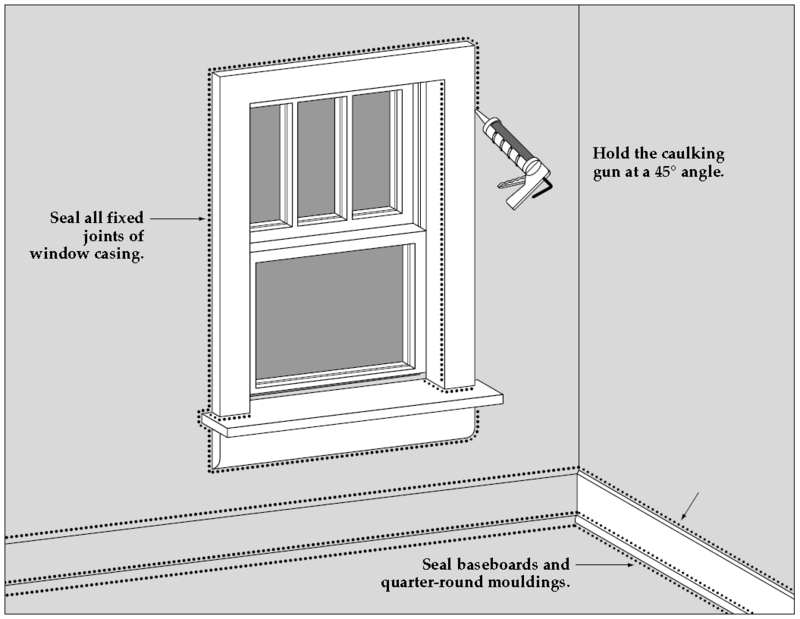 Caulk is used to seal air leaks, cracks, and gaps between window or door frames and your home’s siding (Figure 2). Most caulk is packaged in tubes that fit a standard caulking gun. When shopping, you will find many different products, with prices ranging from two to fifteen dollars or more per tube. Be sure to read the labels and select the product that will work best for your particular application. If possible, opt for higher-quality; cheaper products may last only a few years, while premium-priced caulks are normally designed to last 20 years or more. Figure 2. Apply caulk to seal fixed windows. [Click to view full size image.] Credit: U.S. Department of Energy, Office of Energy Efficiency and Renewable Energy (EERE)/National Renewable Energy Laboratory (NREL). Weatherize Your Home—Caulk and Weather Strip. June 2004. Always apply to a clean, dry surface. Apply in a continuous stream, avoiding stops and starts. Make sure to fill the crack or gap completely. Reapply if necessary. Weatherstripping is material that is used to seal moveable joints like doors and windows. There are several types of material that can be used, with varying cost, durability, and ease of installation. You should choose a product that can withstand the conditions of its specific location; consider friction, temperature, weather, and wear. For doors and windows that are used most frequently, use more permanent types of weatherstripping. The additional time and money spent installing these items will pay off in decreased energy bills and maintenance costs. When installed correctly, weather-stripping should allow your doors and windows to open properly and seal well when closed. For more information on choosing the correct weatherstripping product for your project visit the Energy.gov web page Weatherstripping. Weatherstripping around exterior doors can be checked with a flashlight. With the interior and exterior lights off, move the flashlight slowly around the outside closed door edge. If a helper inside the house can see light shining in, weatherstripping is needed. Weatherstripping should be installed on the door jamb so the material creates a seal with the exterior face of the door on the top and both sides. Door sweeps, thresholds, and door shoes are good ways to seal gaps under exterior doors. A door sweep—a strip of metal (often with a flexible rubber or plastic edge)—can be used on a door with no threshold. The sweep is connected at the bottom of the door, either inside or outside, depending on how the door moves. A gasket threshold replaces an existing threshold and can be attached to the floor directly under the door. (This type of gasket wears quickly in high traffic areas.) Door shoes have rubber or plastic gaskets set into a metal bracket. This shoe is affixed to the door bottom and can be used with any threshold not worn in the middle. Adding or replacing weatherstripping on windows is more complicated than on doors, because it has to be placed in the tracks as well as above, below and between the sashes. Metal or plastic v-channel weather-stripping should be used in the tracks of the windows and in between the sashes. This may have a self adhesive backing but will still need nails or staples to secure it permanently. A self-adhesive foam, designed to be used with windows, or vinyl weatherstripping can be used between the upper and lower sashes and the frame. Iowa Energy Center. Home Series Energy Guide. Retrieved April 16, 2015. Amann, J., Wilson, A., and Ackerly, K. 2012. Consumer Guide to Home Energy Savings, 10th Edition. American Council for an Energy-Efficient Economy, Washington, D.C.
Carll, C. 2006. The Ins and Outs of Caulking. United States Department of Agriculture/Forest Service. General Technical Report FPL–GTR–169. U.S. Department of Energy, Energy.gov. Savings Project: How to Seal Air Leaks with Caulk. Retrieved April 16, 2015. U.S. Department of Energy, Energy Efficiency and Renewable Energy (EERE). May 2014. Energy Saver: Tips on Saving Money & Energy at Home. Retrieved April 16, 2015. Previous Work: Portions of this document are modified with permission from Home Series 1: Home Tightening, Insulation and Ventilation, originally developed by the Iowa Energy Center. a Housing Systems Analyst, Program for Resource Efficient Communities, Florida Cooperative Extension Service, Institute of Food and Agricultural Sciences, University of Florida, Gainesville, FL 32611. Published in May 2009. Revised June 2015.